Below you can see drone footage of Dakota Access machines building Hesco barriers, normally used to protect US military bases in war zones like Iraq or Afghanistan, to protect an area believed to be the drill box site from water protectors. According to the release, Dakota Access expects to have fully mobilized all equipment needed to drill under the Missouri River within 2 weeks. Once all the equipment is in place at the construction site, Dakota Access plans to immediately commence horizontal drilling underneath the river. Dakota Access, LLC closes their statement by admitting their company is still waiting on two construction permits from the Army Corps of Engineers to start the process of drilling underneath the Missouri River. Below is the full public statement by Dakota Access, LLC. The Dakota Access, LLC statement is reported to be in response to a comment given to Bloomberg News on Monday, in which an Army Corps of Engineers spokesman claimed that DAPL had agreed to slow down construction. Tuesday’s comments from Dakota Access appear intended to reassure investors who may be starting to have doubts about funding the pipeline project. It was reported earlier this week that Norweigan bank DNB was considering withdrawing its loan of $342.36 million to Energy Transfer Partners – almost 10 percent of the total funding for the pipeline. On Tuesday, it was announced that the North Dakota Public Service Commission has proposed fining Dakota Access, LLC $15,000 for failing to properly notify state agencies of ancient cultural artifacts discovered at pipeline work sites. Dakota Access is alleged to have violated the terms of its permits by not properly announcing artifact discoveries, as well as by changing the pipeline route without seeking the permission of the Public Service Commission. 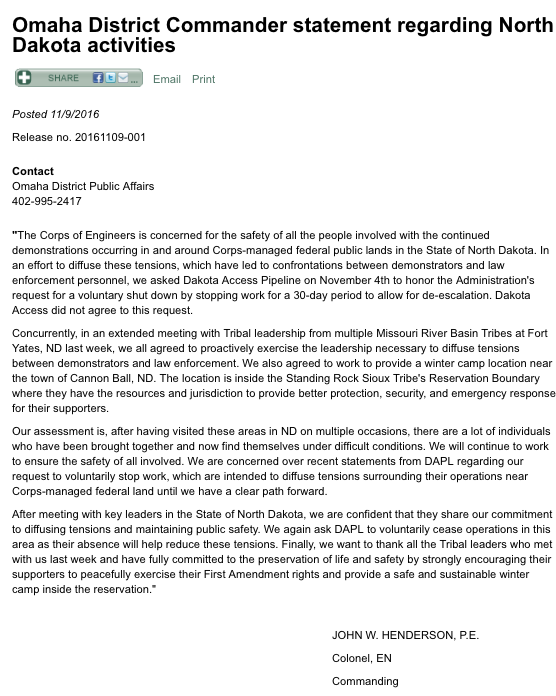 UPDATE: – On the evening of Wednesday, November 9, the U.S. Army Corps of Engineers released a statement by Colonel John Henderson, responding to DAPL’s public comments the day before. 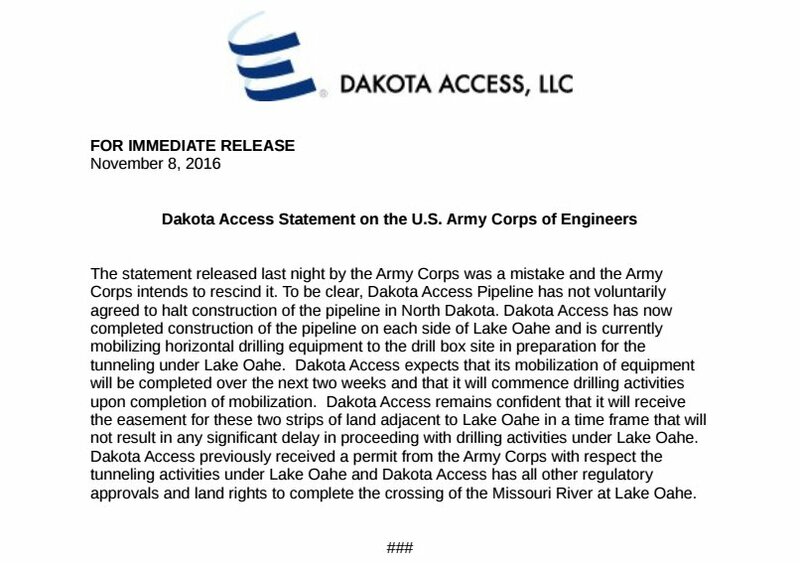 The Corps reiterates that DAPL had ignored requests made by the federal government to voluntarily pause construction. The references made by Col. Henderson to “meeting with tribal leadership to…proactively…diffuse tensions” would appear to confirm that officials from some tribal governments have been collaborating with the Army Corps and law enforcement. In the weeks since the military police eviction of the Oceti Sakowin 1851 treaty camp on October 27, security teams claiming to act on behalf of tribal officials have repeatedly formed lines to keep people in camp from demonstrating on the front line on Highway 1806.